“Page Types Not Updating” – Forum Thread – Discuss – Symphony. I am running Symphony 2.5.2 (thanks to Brian Z!). 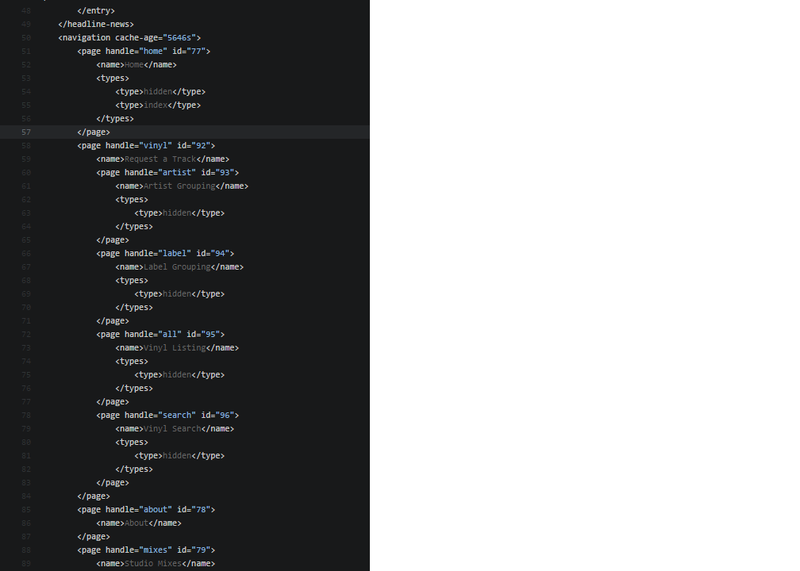 After changing a page type (i.e., page/type/types), it does not reflect in the "Navigation" node in the XML. For example, I am trying to hide certain pages from my navigation using the 'hidden' page type, and the page type isn't updated in the XML. I noticed in the XML "navigation cache-age" (see attached photo); it continues to grow. Is that where the problem lies? I have tried to "reset" the cache through the extension "Cache Management" but have had no success. Does anyone have a solution to my problem? Any help would be greatly appreciated! Thanks so much. @ashrimplin - you are using Cacheable Datasource, look at this to see how to purge the cache of your navigation. When you create or edit a datasource that fetches entries from a section, you will see an additional "Cache" option at the bottom of the editor. Change the number of seconds to suit your requirement. A value of 0 means no caching. As always, you come correct! Thanks a lot, man!